When was the last time your bathroom left you feeling rejuvenated and inspired? It might be the right time for an update with some of the new year’s most popular trends. In 2019 bathrooms are moving towards the future with streamlined, technology forward designs that all have a hint of luxury. Natural materials like tile and marble are at the forefront with added greenery and minimalist color palettes. We’ll take a look at five of our favorite new bathroom trends. When was the last time your bathroom left you feeling rejuvenated and inspired? From greek mosaics to Italian color palettes to Turkish tile shapes; there is no question that the Mediterranean is a significant influence this year. We love when these bold and dramatic tile patterns and colors are used as a focal point surrounded with more subtle, understated elements to help the tile pop. In a sleek and modern bathroom clean, bright, and white is the goal. Bright white walls, subway tile, and natural light are the key factors to this style; it’s a particularly useful tool for making small bathrooms feel larger than before. From precise temperature settings to Bluetooth enabled shower heads; technology is still leading the bathroom trendscape. Last year intelligent medical cabinets were a huge hit, while we see less of those, bathroom speaker systems are still massive. Having a fireplace in the bathroom isn’t for everyone. But if you have a soaker tub r spend time relaxing in a bath, a bathroom fireplace is a great way to add to the atmosphere. Along with giving dramatic mood lighting, it can help improve the heating in the room. This quickly growing trend is likely thanks to the ever-growing love of millennials for their pets. A recent study showed that millennials were more likely to buy a house for their dog than for their kids; designing with pets in mind is expected to be a growing trend. 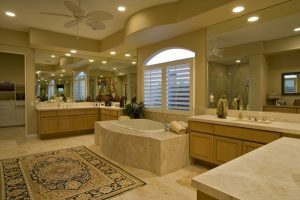 ROCK TOPS FABRICATIONS USES THE LATEST TECHNOLOGY TO ENSURE THAT YOUR NEW BATHROOM IS DESIGNED, CUT, AND FINISHED EXACTLY HOW YOU WANT IT. WE HAVE OVER A DECADE OF EXPERIENCE AND HAVE BEEN CONSTANTLY IMPROVING OUR SERVICES AND OFFERINGS TO MEET THE DIVERSE NEEDS OF OUR CUSTOMERS. IF YOU ARE IN THE MARYLAND, D.C., OR VIRGINIA AREA AND LOOKING FOR A BEAUTIFUL NEW REMODELED KITCHEN, GIVE US A CALL AT 410-363-4257. FOR MORE INFORMATION AND TIPS ON MAKING YOUR HOME YOUR OWN, FOLLOW US ON SOCIAL MEDIA AT TWITTER, FACEBOOK, YOUTUBE, GOOGLE+, PINTEREST, AND HOUZZ. This entry was posted on Friday, February 1st, 2019 at 3:00 pm. Both comments and pings are currently closed.